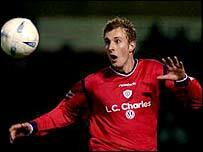 Crewe striker Rob Hulse has been transfer-listed by the First Division club after rejecting a one-year extension to his contract. The 23-year-old marksman, who netted 27 goals in the Railwaymen's promotion-winning campaign to Division One, has one year left to run on his current deal. "Rob Hulse has declined the offer of a new contract and is therefore available for transfer," Alex boss Dario Gradi told the club's official website. Assistant Neil Baker said: " The search for a replacement has already begun , and while we know its hard to replace someone who scored 27 goals last season we'll definitely be looking to increase our striking options." Meanwhile, Bradford chairman Gordon Gibb has dismissed speculation linking the Bantams with Crewe defender Dave Walton. The 30-year-old rejected a new deal at Gresty Road and is looking for a new club. "Although I can't categorically say that no-one has enquired about him, he is not someone who we are seriously discussing," said Gibb. "There are any number of players that Nicky Law may have looked at or had watched and maybe someone has spoken to his agent. "But we're not talking about him being an imminent signing," Gibb told the Bradford Telegraph and Argus. Meanwhile Crewe Alexandra have announced a new sponsorship deal for its main stand with local company Air Products. Commercial executive Alison Bowler told BBC Radio Stoke: "We're delighted that we've been able to maintain our links with businesses in the area, as we feel it enhances the family feeling we have at the club". Tickets are now on sale at the club for the two pre-season friendly games against Liverpool on 19 July and Everton on 22 July.